306 pages | 26 B/W Illus. 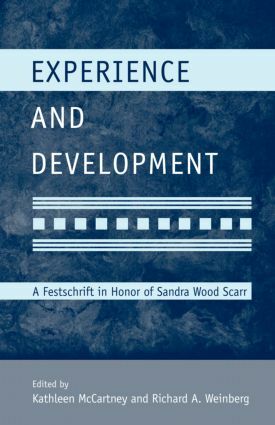 The scope of these chapters reflects the strong influence that Sandra Wood Scarr’s scholarship—her empirical research and theoretical contributions—has had on what we know about experience and development via the lens of the psychological sciences, especially the fields of developmental psychology, behavior genetics, early education and child care. K. McCartney, R. Weinberg, Preface. R. Weinberg, Sandra Wood Scarr: Her Intellectual History, Professional Journey, and Legacy. J. Arnett, J.L. Tanner, Toward a Cultural-Developmental Stage Theory of the Life Course. T.J. Bouchard Jr, Strong Inference: A Strategy for Advancing Psychological Science. R. Polomin, The Nature of Nurture. E. Turkheimer, K.P. Harden, B.D’Onofrio, I.I. Gottesman, The Scarr-Rowe Interaction Between Measured Socioeconomic Status and the Heritability of Cognitive Ability. K. McCartney, D. Berry, Whether the Environment Matters More for Children in Poverty. I.D. Waldman, Contributions of African-American Samples to Contemporary Molecular Genetic Research. K. Deater-Deckard, Parenting the Genotype. J. Dunn, Social Relationships and the Development of Understanding Others. M. McGue, W.G. Iacono, Siblings and the Socialization of Adolescent Deviance: An Adoption Study Approach. H.D. Grotevant, R.G. McRoy, Growing Up Adopted: Birth Parent Contact and Developmental Outcomes. C.P. Benbow, D. Lubinski, Extending Sandra Scarr’s Ideas About Development to the Longitudinal Study of Intellectually Precocious Youth. S.W. Scarr, Epilogue.